This post is sponsored by OXO Brew. I used to be a barista. When I was in college I learned the art of lattes and cortados and milky chai. The job payed my (very cheap) rent, and it gave me access to the local arts scene. A classic Philosophy major thing to do, I know. Pull espresso, steam milk, perform spoken word poetry at the open mic, converse with the customers about Japanese poetics… it was all part of the job. So today I have a long overdue guide for you all: how to make a perfect cup of black coffee, three ways. I drink my coffee black about 90% of the time. I learned long ago that almost anyone can drink black coffee if you do a few things right: brew with fresh coffee beans, choose the right roast profile for the brew method, and brew correctly. It’s a bit tricky when you’re first learning how to do it, but it’s so easy once you get the hang of it. In this guide I’m covering pour-over, french press and cold brew. These methods, as you will soon see, are meticulously perfected. Logan and I have worked on these together for years and years! He’s become quite the coffee scientist what with running his own small-batch-roasted coffee pop up at the local farmers market. He mostly sells cold brew and pour over method, but we brew in many styles at home. He weighed in heavily on these methods you’re about to hear about! So without further ado…. We’ve been using one of these for about two years and love it. 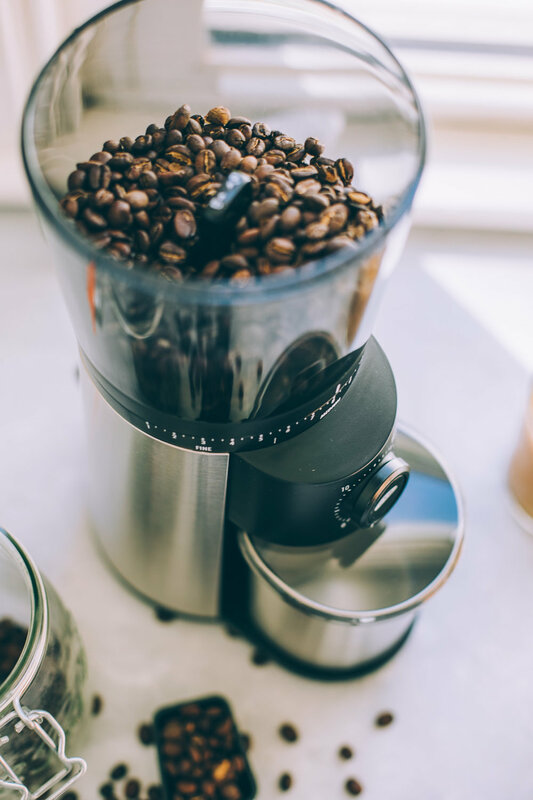 The main reason to own one of these is that the burr grinder crushes the beans uniformly so that each cup is exactly the same. You can also more effectively control the bean coarseness. This one has 15 grind settings, from fine to coarse. It also has a one-touch timer which stores your last setting so you don’t have to reset it all the time. I got one of these last year and it’s become my most-used kitchen item, hands down. It has the classic gooseneck kettle spout, which offers more control when you pour water over your coffee grounds (or tea leaves). But the best part is that you can set precise temperatures and the kettle will hold the temp that you set. This one will hold temp at 170-212°F/77- 100°C. It also has a built in timer to help keep track of your pour over process. Everyone should have a french press! These are great for easy entertaining with friends, and I especially like taking a french press on camping trips. I usually opt for a metal one, but they can be too heavy for back packing. This one is BPA free plastic and very affordable, which means it’s a no-brainer for trips. My favorite brew method. I have a bunch of the drip brewers, but I actually prefer a set that includes a double walled carafe like this one — made from hand-blown borosilicate glass and stainless steel. You can brew directly into a mug or you can brew up to four servings with the carafe. This one comes with a cork top for the server, which is so convenient for keeping heat in while I’m pottering around making breakfast. Easily my favorite method for warm months, but equally beloved in my house all year round. We will often warm up our cold brew for instant low-acid coffee during Winter. Logan and I have used this type of cold brew maker for many years for small-batch testing our cold brew method, and it’s very reliable. This maker can brew enough concentrate for 14 coffee drinks. It comes with a glass carafe that can be stored in the fridge (it looks like a beaker, which Logan and I both admittedly love). Coffee style: rich, full bodied. Notes: This method is great for breakfast blends, and does well with darker roast profiles. I will sometimes brew this with a pinch of cinnamon or cardamom in the brewer. Place coffee grounds in the bottom of the French press. Pour just enough hot water over the coffee to soak the beans and let the fresh coffee bloom (the coffee will expand and release a toffee-colored crema). Let sit 30 seconds, then fill the French Press to fill-line with hot water and cap with the French Press plunger. Let steep another 3 minutes and 30 seconds (4 minutes total). Then press down on the plunger, pour and enjoy! Notes: This method is best for more delicate coffee flavor profiles and light roasts. The following method will produce a mild but strong cup with a clean finish. Set a paper filter into the pour-over drip brewer. Use cold water to wet the filter, letting any excess water drip off into the sink. Set the drip brewer over a mug or carafe. Place your ground coffee into the filter, tapping it to level out the grounds. Pour just enough hot water over the grounds to let it bloom (the grounds will expand and a toffee-colored crema will release). Wait 30 seconds. Then slowly pour the rest of the hot water over the grounds, letting the coffee slowly percolate. Other notes: Coffee blends that are designed for espresso are often excellent in cold brew! Look for blends that are medium roasts with chocolatey tasting notes for best results. When using OXO brewer, place a small paper filter into the bottom of the brewer as directed. Pour the ground coffee directly into the OXO brewer. Pour half of the cold water over the grounds and stir to evenly saturate everything. Add the rest of the water and stir again to make sure all of the grounds are saturated. Set the brewer in the fridge for 16 hours, or on the counter at room temperature for 12 hours. Set a carafe under the brewer and percolate the cold brew into the carafe. This process can be slow, so you can do other things while it’s percolating. Now you have a coffee concentrate! You can store this in the fridge and dilute it per-cup throughout the week. To dilute: add 1 part coffee concentrate and 1 part water to a glass. I usually do 4 oz concentrate to 4 oz water. Add ice and serve. Great with a splash of cream! I usually use a non-dairy coconut creamer. This conversation and guide is sponsored by OXO Brew. All opinions and recipes are my own, as always! Thank you for supporting the brands that support this site.